In honor of Darwin's birthday, a little free fiction: "Darwin's Suitcase" by Elisabeth Malartre. It's a story about Darwin meeting a time traveler who tries to convince him that his future publications will change the world. In 1862 Darwin predicted that the unusually long spur of the Madagascar orchid (Angraecum sesquipedale) meant that there must exist a moth with a proboscis long enough to reach the nectar and ensure pollination of the flower. Such a moth (Xanthopan morganii praedicta or Wallace's sphinx moth) was discovered in 1903, but it wasn't confirmed until 1997 that Wallace's sphinx moth is indeed the pollinator of Darwin's orchid. Read Elisabeth Malartre's "Darwin's Suitcase" at Jim Baen's Universe. Wikipedia on Captain (later Admiral) Robert FitzRoy - captain of the Beagle - and the debate over the Origin of Species. 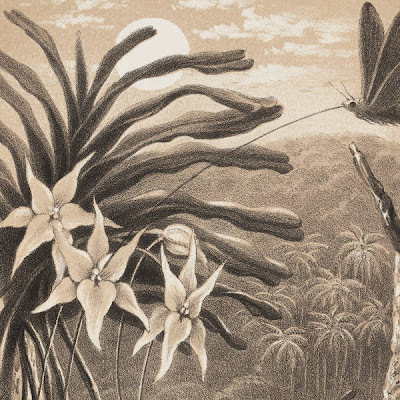 Image: Detail from Sphinx moth fertilizing Angreguom gesquipedale (orchid) in Madagascar, from Alfred Russell Wallace's article "Creation by Law" Quarterly Journal of Science Vol. 4 (1867). The article supported Darwin's hypothesis.